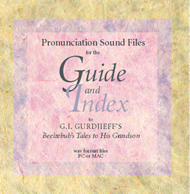 This CD ROM provides spoken pronunciation for words contained in the “Pronunciation Appendix” to the Guide and Index to G.I. Gurdjieff’s Beelzebub’s Tales to His Grandson. The CD ROM is prepared for use on a computer and will not run on an audio CD player. It contains a pdf document which acts as an index to the 1,200 sound files on the CD. An Adobe Acrobat Reader and sound software are required to open the pdf document and play the sound files.